Fortunately for the world of black metal, there is a war going on between two major schools of this dark (or dark sounding) music. This war behaves like the turning and shoveling of an agricultural ground, refreshing it and yielding remarkable fruits from different seeds. This war is being fought between the orthodox caveman school of black metal, keeping it underground (a term which is rapidly losing it’s meaning), simple and as satanic as possible, and the other school of thought which brings light and show new directions for this genre of music to evolve to. I imagine that the name of the first track can tell you we are discussing the newer school in here. Wormsblood approach their music with their own tools, blending this dark music with mystery, fantasy and even, I suspect a certain sense of humor. 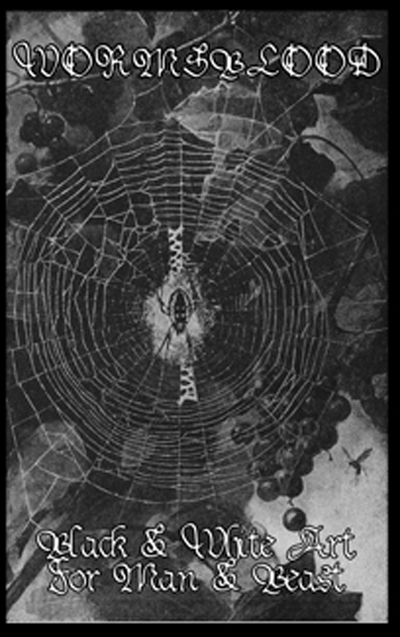 As clouds of disturbing ambient sounds that smell of ritualistic ceremonies blend with maniacal screaming and a storm of guitars and drums, “Black and white art for man and beast” creates a painful, piercing, yet somewhat purifying environment for the listeners to be struck and sustained by these nine tracks. “Morning of drunkenness” opens with an obscure, beautiful sounding eerie introduction. Distant whispering and painful chanting give way to the utter explosion in “The hunt is over” and the rest of the album. The most powerful song in this album, in my humble opinion, is unfortunately the shortest. “Crypt insides a kingdom” offers element of folk music into the insane screaming and melancholic string section. The results of this recording are beautiful and touching. The haunting feeling of cold pain, which diffuse itself inside the warm veins of emotional, even spiritual climax which bursts at least once in each song, forms great moments in a full grasping document of furious throat abuse , be it the result of a morning of drunkness or of a sword swallowing. Frankly, my dear, I don’t give a damn, I’m happy either way.